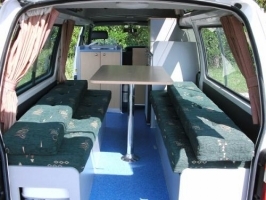 The Wendekreisen Budget 2+1 campervan is a proven workhorse on New Zealand roads and well known by New Zealanders. The 2004 model Toyota HiAce is extremely reliable and performs well in windy conditions. The fuel consumption is reasonable at 11.5l/100km. There are 3 seats in the front without passenger airbag, well suited for travelling with children. Two large beds, a fridge, a gas stove, on board cold water and plenty of storage offer an economical way of sleeping in comfort and cooking a meal for up to 3 adults. The seating and table in the rear convert to a comfortable double bed. A single bed is located just above the main bed. 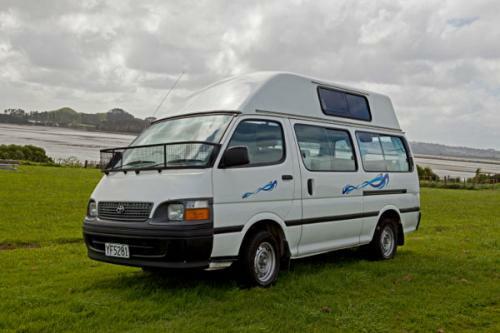 This vehicle is certified self contained in accordance with New Zealand Standard 5465:2001. 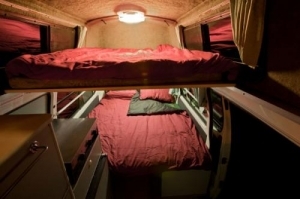 This will allow you to take advantage of many free or low cost campgrounds in New Zealand.